Quick summary: In this lesson, students will consider what makes an ideal ‘place’. They will explore an outdoor place in their school then work to a design brief to design and draw an ideal place in the school. Students will practise texture rendering techniques and apply them to their design. They will annotate their design and write an artist statement to justify the design choices made. Students will reflect on the process in a peer-review exercise. Students understand that a place can have an effect on them. Students understand how to follow a design brief. Students learn how to apply a range of colour pencil and fine liner techniques. Syllabus outcomes: VAS 3.1, VAS 3.2. General capabilities: Literacy, Critical and Creative Thinking, Ethical Understanding. Cross-curriculum priority: Sustainability OI.4, OI.5. Relevant parts of Year 5 & 6 Visual Arts achievement standards: Students explain how ideas are represented in artworks they make and view. Students use visual conventions and visual arts practices to express a personal view in their artworks. They demonstrate different techniques and processes in planning and making artworks. They describe how the display of artworks enhances meaning for an audience. 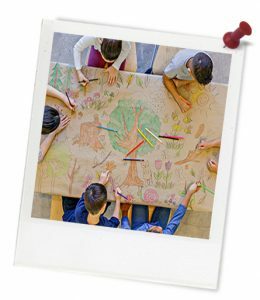 Unit of work: Creative Sustainability – Year 5 & 6. Level of teacher scaffolding: High- take the class outside for an observation activity. Resources required: Student Worksheets – one copy per student. Device capable of presenting a video to the class. Texture Rendering Technique: practice handout. 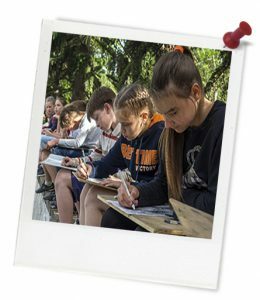 Tips for getting your class outside. A3 paper, Colour-Grip Pencils or Junior Grip Pencils, grey lead pencils, fine liners, erasers, sharpeners, rulers. Keywords: Sustainability, outdoor, nature, texture, design, brief, visual art. ...work to a design brief. ...develop ideas for an ideal outdoor place. ...use colour pencil and fineliner techniques to portray different surface textures. Sustainability describes the ability to keep going at the same rate and in the same (or better) condition as before. In order for our world to be able to sustain us, as well as the generations to come, we need to change. It’s time to think differently - and more creatively - about sustainability and the future of our planet. Where is the place you are observing? How do you feel when you are in this place? What do you see in this place? What are some positive things that you notice about this place? Design Problem: Your school requires a place that encourages socialising, relaxation, play and learning activities. Materials: The materials used for the new outdoor area must be natural and/or recycled. Constraints: The place should 'fit in' with the natural surroundings.